B-17F Hells Angels, tail number 41-24577 was the first heavy bomber to complete 25 combat missions. Hells Angels remained in theater until 1944. 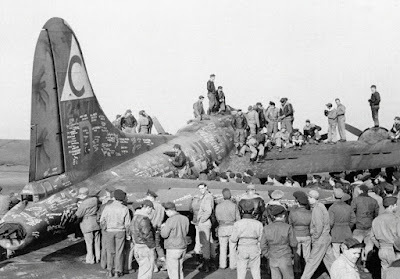 On February 3, 1944 GI’s swarm over the Hells Angels, to put their names on the Flying Fortress before its take-off for the US and a War Bond tour. Hells Angels, one of the most famous Fortresses in the U.S. Army 8th Air Force, made 49 raids, dropping more than a quarter of a million pounds of bombs on enemy territory.